Ferrari drivers Kimi Raikkonen and Felipe Massa recorded the fastest two laps during the opening two practice sessions for the Malaysian Grand Prix. Nico Rosberg and Kazuki Nakajima secured a Williams one-two in the first session with times of one minute 36.260 seconds and 1:36.305 respectively. 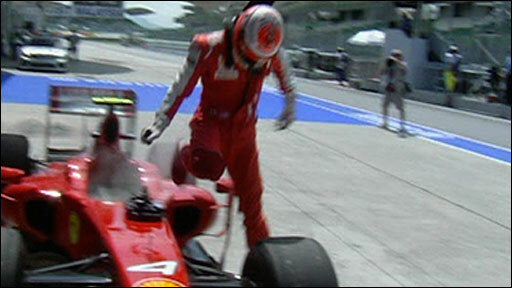 But in the second Raikkonen went quickest with 1:35.707 and team-mate Massa posted a lap of 1:35.832. 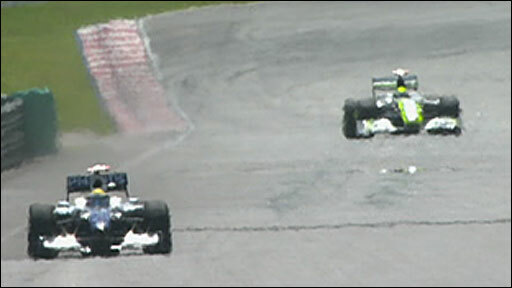 Brawn GP's Jenson Button was seventh and McLaren's Lewis Hamilton 11th. After being stripped of his third place in Australia for misleading stewards in an inquiry, Hamilton's horror week continued as he was fined 1,200 euro ($1,600) for breaching the pit lane speed limit during morning practice. 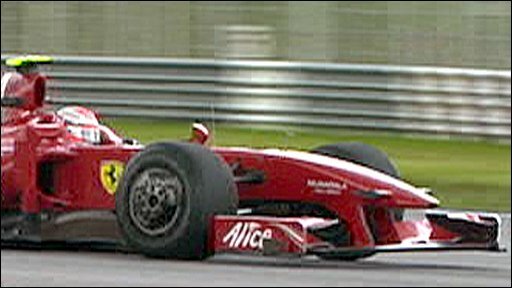 Rubens Barrichello was sixth quickest in practice but the Brazilian will start from further back in Malaysia after he was given a grid penalty. The veteran driver received a five-place penalty after Friday's session because the team put a new gearbox into his Brawn. Who do you think will be on the top step of the podium in Malaysia? The Red Bulls of Sebastian Vettel and Mark Webber finished third and fifth respectively with Rosberg, who topped the timesheets in all three practice sessions at the season-opener in Australia last weekend, fourth. Raikkonen's lap was faster than last year's pole-winning time set by Massa and the Fin's strong showing went some way to removing doubts about the reliability of the Ferrari after a morning mishap. The 2007 world champion, who won at Sepang in 2008, had completed 18 laps when smoke began billowing into the cockpit and streaming from the rear of the car. Ferrari did not disclose the problem, amid reports that the batteries from the new Kers (kinetic energy recovery system) system had overheated. Only four teams are fitted with Kers - Ferrari, McLaren, BMW Sauber and Renault - which recovers some of the energy generated by the car's braking process for extra power. Kers is seen to be an advantage at the Sepang circuit, which features a combination of long high-speed straights, and tight, fast and twisting turns. The track temperature climbed to 47C (116F) at the start of afternoon practice but soon dropped with dark clouds threatening rain that never materialised, depriving the teams of wet weather testing. This heightened the chances that they will go into Sunday's race - with rain forecast - without the benefit of acquainting themselves with a wet track. Force India's Giancarlo Fisichella was the main casualty of the second practice, spearing off the track on the dual right-handers of turns 10 and 11, sideswiping the tyre wall. It ended his session, but he walked away unhurt. Fernando Alonso, meanwhile, is hoping to recover from an ear infection in time for Sunday's Grand Prix. The double world champion could only manage a total of 32 laps in his Renault, finishing 16th on the timesheets in the morning and one place higher in the afternoon. "We tried not to do too many laps today as I wasn't feeling 100%," he said. "It's a very demanding weekend in terms of the heat because we sweat so much but it was important we still got enough information." "Hopefully I will recover more this evening and feel better tomorrow so I can give my maximum for qualifying, which I think will be one of the most important parts of the weekend. We need to be ready for that."